In one Karen State township, ethnic literature teachers are seeing a windfall of cash thanks to a donation from the Karen National Union’s education wing. The Karen Education Department (KED) provided funds to support 473 village-appointed teachers and ethnic literature teachers in the Win Yaw area under Kya-in Seikgyi township for the 2017-2018 academic year. The donation ceremony was held at Yar Pyae Dhamma Beikman in Kha Lel Village on November 12. 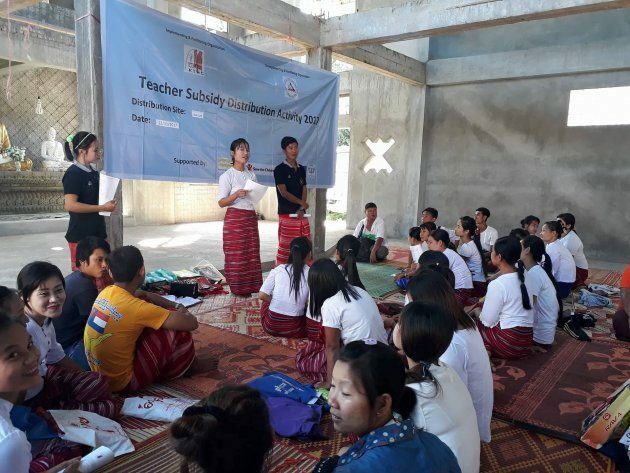 “We have given K185,000 to each of the 473 village-appointed teachers, who still have not received government support, and to Karen literature teachers for the 2017-2018 academic year,” said Mahn Shar Htu Gaw, deputy education officer of The township’s KED office. He added that some schools still have not received permission to teach ethnic literature and urged the government to give full recognition to the subject. The Ministry of Education currently provides a modest monthly stipend of K30,000 to ethnic literature teachers. The ministry announced a plan to appoint these teachers as daily-wage staff (also called teaching assistants) at the primary school level starting from June next year. In addition to the difficult wage situation, ethnic literature teachers say they are pressed for time as their subject is often squeezed into narrow slots between other classes. Nan Soe Khin, a primary school headmistress from Kha Lel Village, said that while learning Burmese can help students attain higher education or advance their career, learning ethnic literature can assist in understanding history culture and context. She urged the government to make room for ethnic literature classes in the school timetables. The KED donated K240,000 to each teacher in the previous academic year. It also provides school sports equipment, books, stationery and teaching aids every year, according to teachers.